PT Toyota-Astra Motor - TAM or known as "Toyota-Astra Motor" a reputable and leading privately-owned company in Indonesia, that is involved in automotive industry. Toyota-Astra Motor operates primarily as a sole distributor of all Toyota and Lexus brands in Indonesia. Toyota-Astra Motor has core business competencies in the field of distribution and import of Toyota brand vehicles in Indonesia. PT Toyota-Astra Motor is a multinational joint venture company between Indonesia PT Astra International Tbk (Astra Group) and Japan Toyota Motor Corporation (TMC). As today, Astra Group holds 50 %% shares in Toyota-Astra Motor and 40% remaining shares was owned by TMC. Domiciled in Jakarta, Toyota-Astra Motor now supported by 5 main dealers spread in all over Indonesia, comprise of PT Astra International Tbk - Toyota Sales Operation (Auto2000), PT Agung Automall, PT Hasjrat Abadi, PT New Ratna Motor (Nasmoco), and NV Hadji Kalla Trd Co. 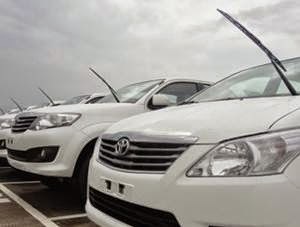 According to information found in Toyota-Astra Motor's website as cited by JobsCDC.com, Toyota has had a presence in Indonesia for more than 48 years. In 1969, Astra Group was appointed as the distributor of Toyota vehicles in Indonesia. PT Toyota-Astra Motor was formed officially in 12 April 1971. In 2003, Astra Group and TMC reorganized Toyota’s business in Indonesia through 2 companies; PT Toyota-Astra Motor to focus on distribution and PT Toyota Motor Manufacturing Indonesia (TMMIN) to focus on manufacturing and export of Toyota brand vehicles. Bachelor or Master Degree (S1/S2), majoring in Management, Accounting, Marketing, Mathematics, Statistic, Business Administration, Economics, Industrial Engineering, Mechanical Engineering, Electrical Engineering, Civil Engineering, Informatics Engineering. Preferably those with organizational experience. Diploma Degree (D3), majoring in Management, Accounting, Administration, and all Engineering majors. JobsCDC.com now available on android device. Download now on Google Play here. Please be aware of recruitment fraud. The entire stage of this selection process is free of charge. 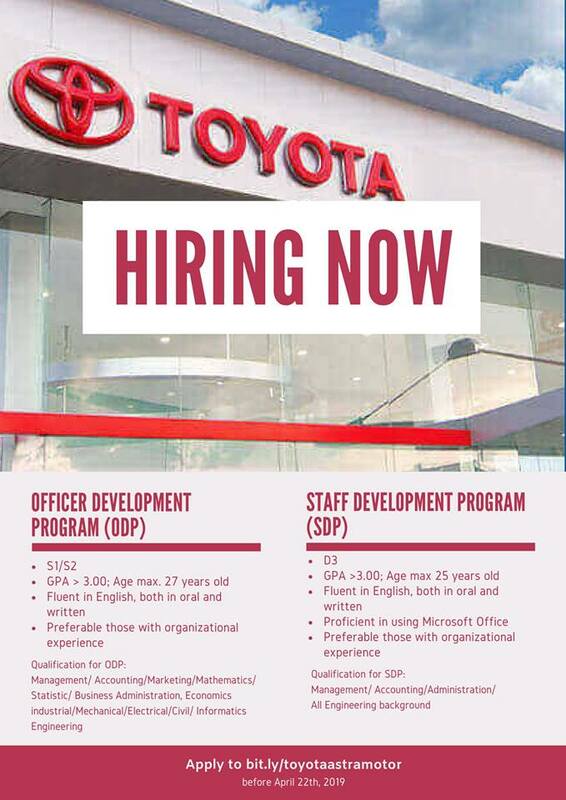 PT Toyota-Astra Motor - Fresh Graduate Development Program TAM Astra April 2019 will never ask for fees or upfront payments for any purposes during the recruitment process such as transportation and accommodation.